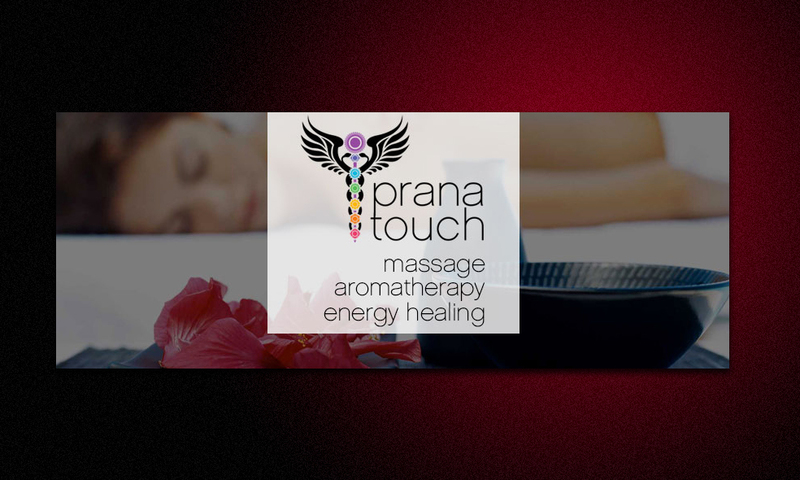 Welcome to our Spotlight Client of the Month — Prana Touch! 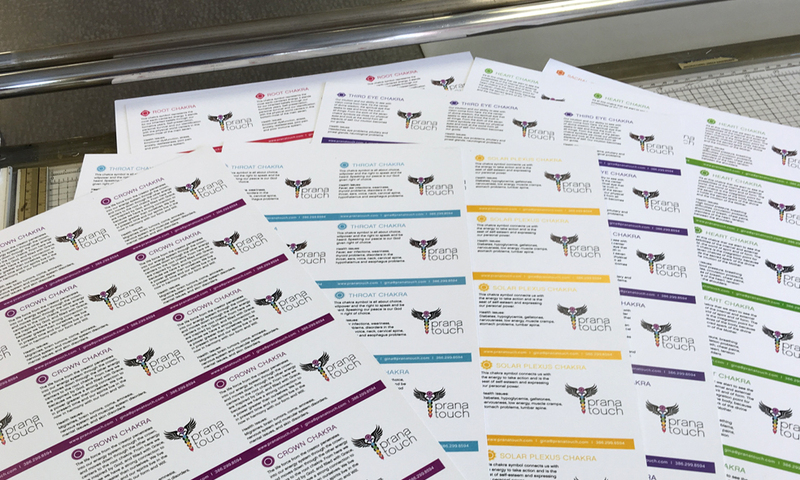 We then set about creating and developing the website and social media presence to provide an internet footprint and voice to share with the audience. 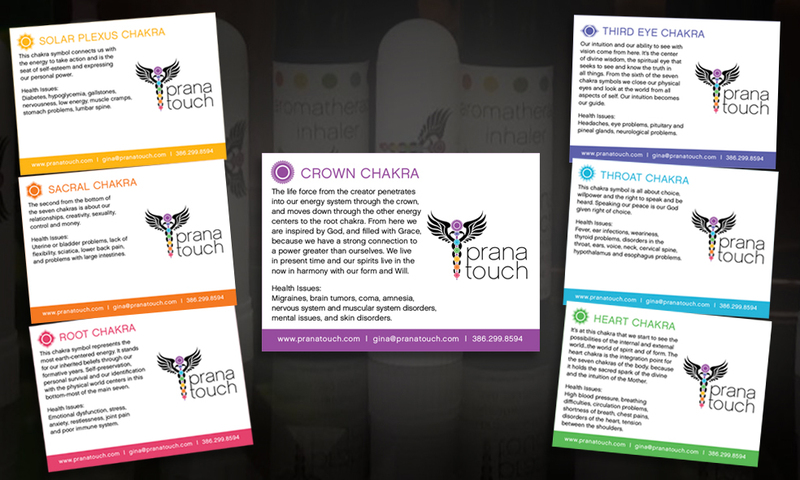 printed and produced labels and cards for the 7 Chakra scents. 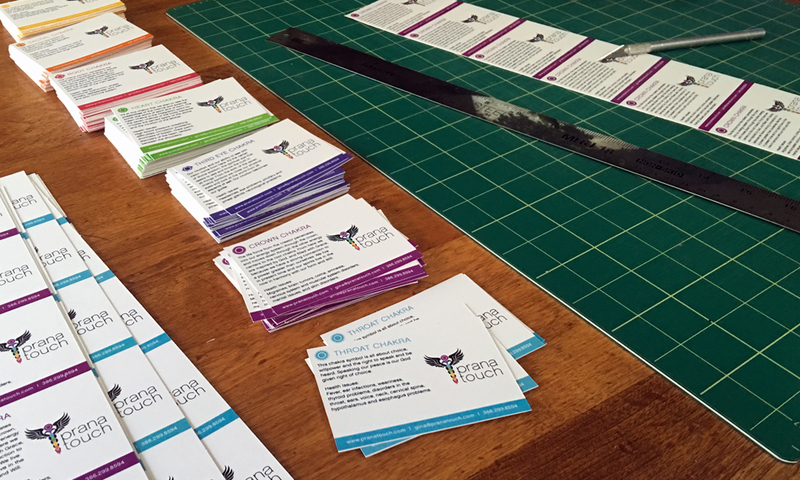 Cutting the cards to size took us back to the days of cutting boards, exacto knives and straight edges we used so frequently. It was great rolling up our sleeves and getting our hands dirty again. 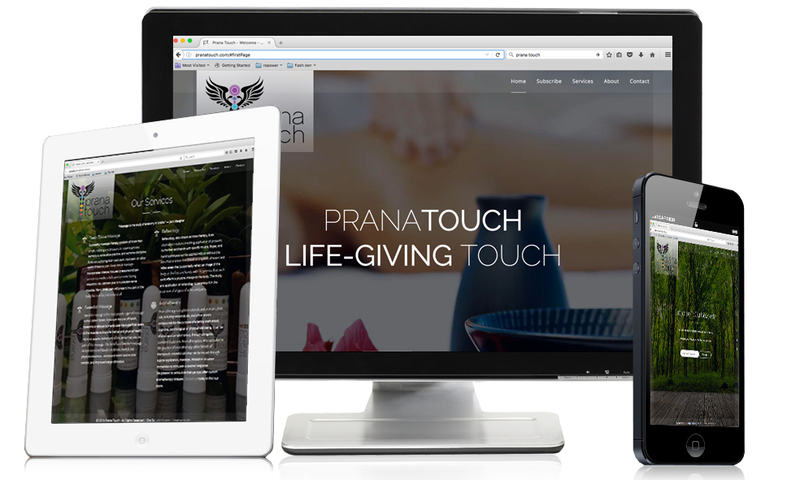 We continue to support Prana Touch as they grow their business. 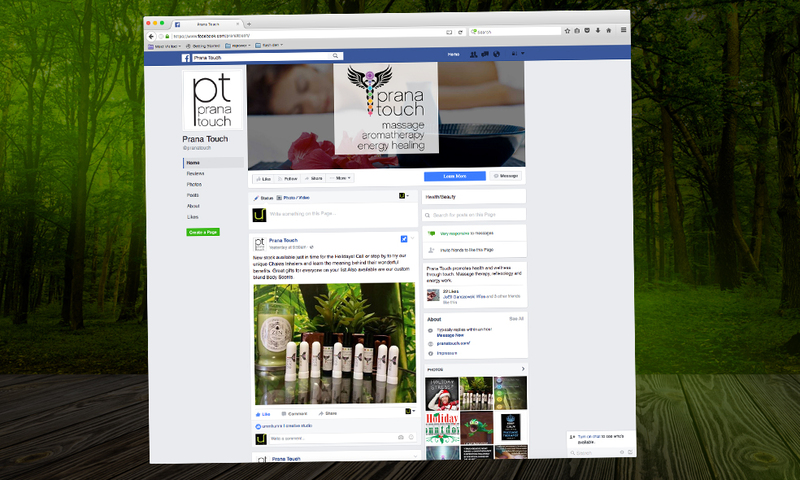 If you have acute or chronic pain, check out Prana Touch or follow them on Facebook to see if there’s a remedy for you. 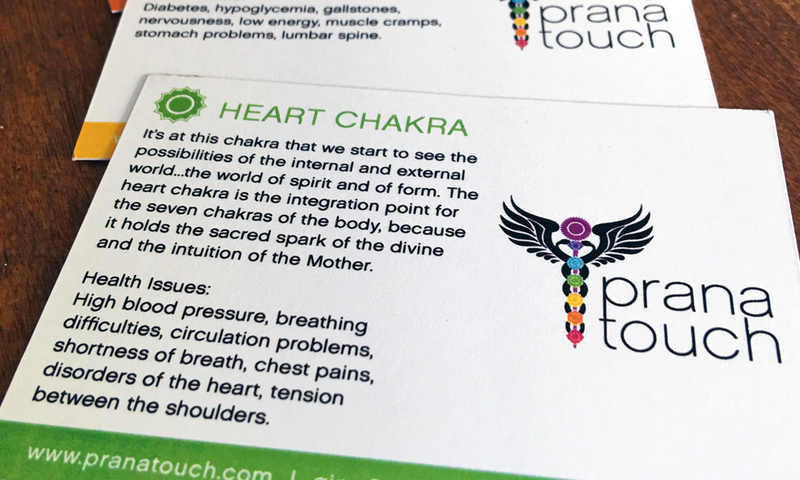 Prana Touch was created to help those who suffer from chronic and acute pain. Constant daily stress and physical exertion can dramatically affect your overall physical well being. Our posture and mobility becomes compromised by crouching at a desk for long periods at a time. Texting throughout the day on our mobile devices, also known as Text neck, not only causes eye strain, but puts a tremendous amount of tension on our necks. Throw in day to day stressors and it’s no wonder we feel like knotted balls with exposed nerve endings. 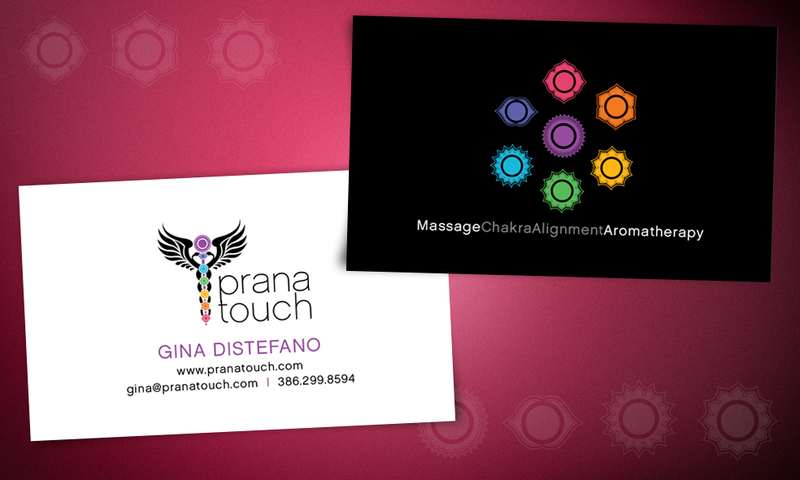 Obtaining a massage therapy license at Palm Beach State College in 2015, Prana Touch visionary Gina DiStefano focuses on Swedish Massage, Deep Tissue, Reflexology, Trigger Point, Myofacia Release, Reiki and Stretching. 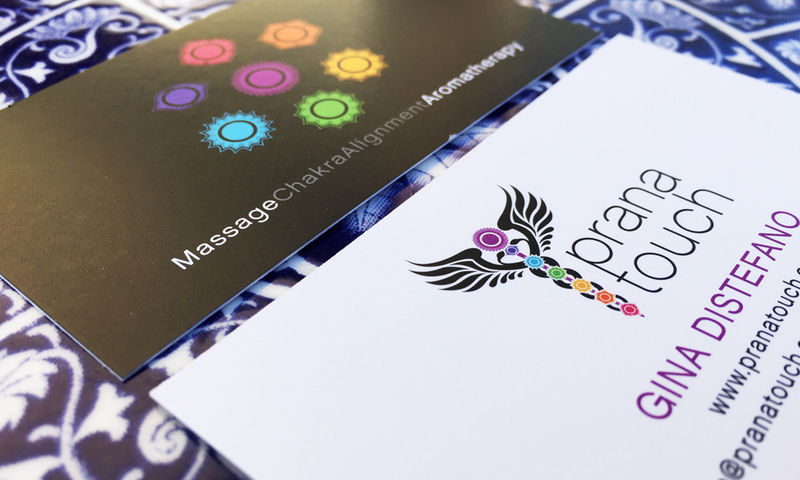 By working with great energy and intent on each client, Gina’s knowledge goes beyond human physiology and anatomy to help relieve ailing bodies and minds. 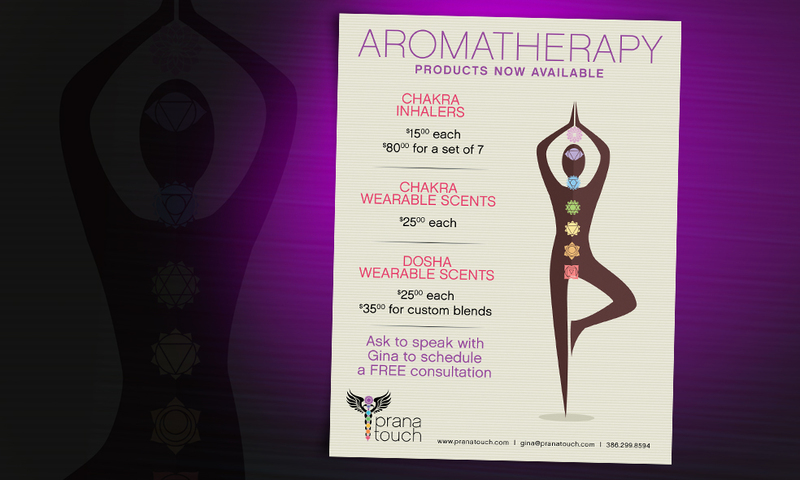 She incorporates chakra alignment and aromatherapy in conjunction with massage, as well as creating unique aromatherapy blends for inhalation. 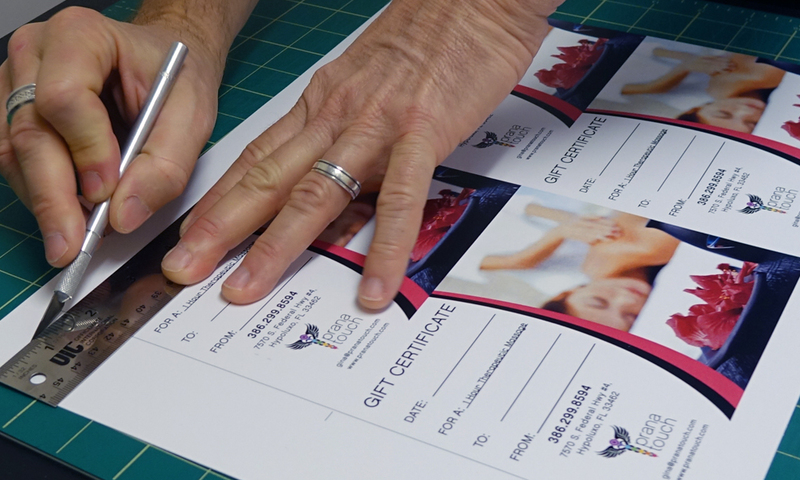 Successful massage therapy consists of more than simple rubbing and pressure; it requires precise technique, exhaustive practice, and extreme discipline. 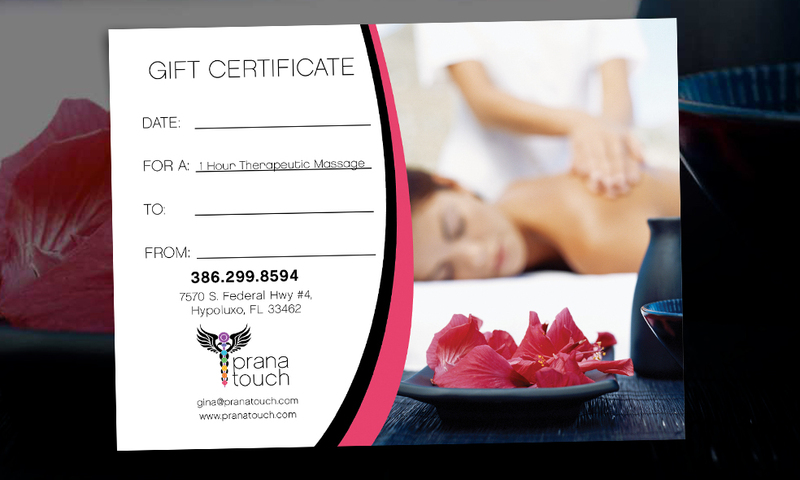 If you are suffering from back pain, neck pain, or other types of muscle pain. 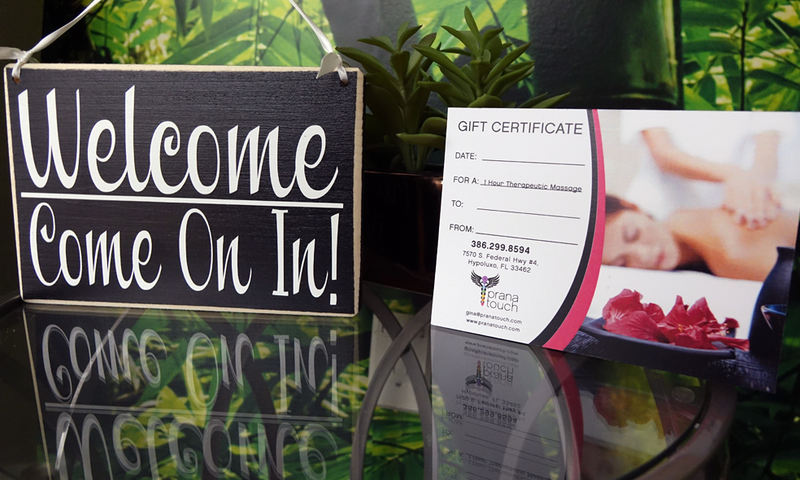 Deep tissue massage incorporates intense, focused pressure and can sometimes involve a little pain to evoke lasting relaxation. My ultimate goal is to alleviate tense muscles. Many times, pain will present in a part of the body that is in fact not tense at all. Reflexology, also known as zone therapy, is an alternative medicine involving application of pressure to the feet and hands with specific thumb, finger, and hand techniques can be applied with or without the use of oil or lotion. It is based on a system of zones and reflex areas that purportedly reflect an image of the body on the feet and hands, with the premise that such work effects a physical change to the body. The study and application of reflexology is paramount in the treatment of al types of aches and pains. Aromatherapy uses plant materials and aromatic plant oils, including essential oils, and other aroma compounds for the purpose of altering one’s mood, cognitive, psychological or physical well-being. It can be offered as a complementary therapy alongside standard treatment. 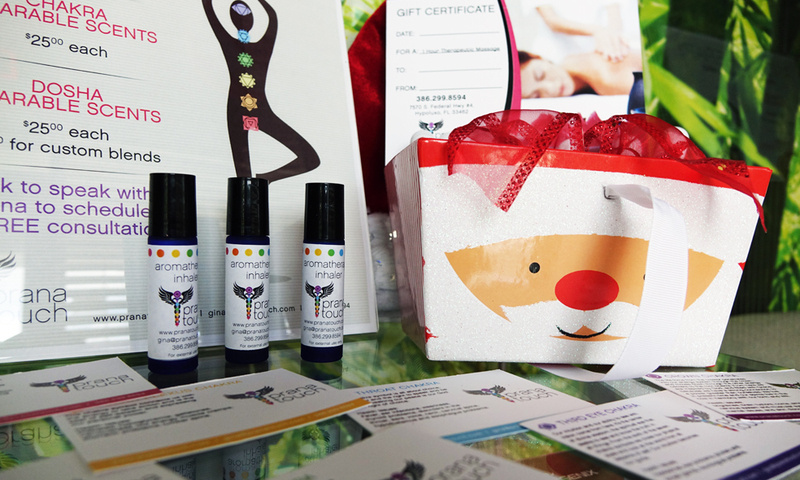 Aromatherapists, who specialize in the practice of aromatherapy, utilize blends of therapeutic essential oils that can be issued through topical application, massage, inhalation or water immersion to stimulate a desired response. 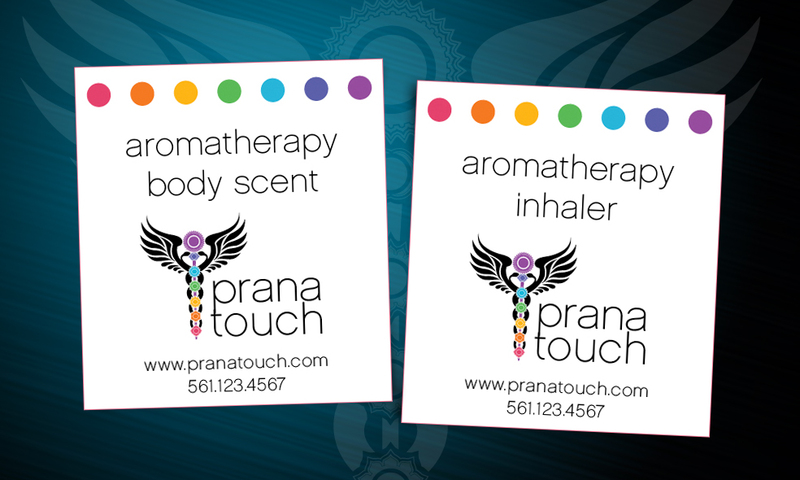 We pleased to announce that we now offer custom aromatherapy inhalers.